^ "FAA Registry (N736PA)". Federal Aviation Administration. ^ "Civil aircraft register (PH-BUF)". Inspectie Leefomgeving en Transport. ^ a b Kilroy, Chris Special Report: Tenerife Archived 2007年10月18日, at the Wayback Machine. AirDisaster.com. ^ Air Line Pilot, August 2000, page 18 Archived 2006年5月13日, at the Wayback Machine. ^ "Crash of the Century." Cineflix Productions. 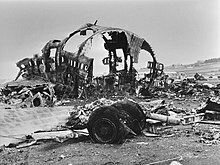 ^ http://www.upi.com/Audio/Year_in_Review/Sadat-Visits-Israel/12361881614363-1/#title "Tenerife Disaster, 1977 Year in Review." ^ Shari Stanford Krause (2003). Aircraft Safety: Accident Investigations, Analyses, & Applications, Second Edition. McGraw Hill Professional. p. 205. ISBN 978-0-07-143393-8. https://books.google.com/books?id=YKSwwwyWaT0C&pg=PA205. ^ JAR Professional Pilot Studies by Phil Croucher. books.google.com. https://books.google.com/books?id=KY-MBUeQoZEC&pg=SA1-PA67&lpg=SA1-PA67&dq=pan+am+there+he+is&source=bl&ots=cN_sZj-YTT&sig=UTD2REj43T8Eey9i1i-ejqd7J-k&hl=en&sa=X&ei=lXaEUYb5M5Ti9gTTzICgCw&ved=0CGAQ6AEwCA#v=onepage&q=pan%20am%20there%20he%20is&f=false 2013年5月3日閲覧。.